﻿ HuntingNut » Forums » General » General » Better maybe !!!! Posted: Fri Oct 14, 2016 8:48 am Post subject: Better maybe !!!! Posted: Fri Oct 14, 2016 4:22 pm Post subject: Re: Better maybe !!!! Tremblay, we could make one of those! I'm trying to see exactly how the trigger works though. Posted: Fri Oct 14, 2016 6:46 pm Post subject: Re: Better maybe !!!! Posted: Fri Oct 14, 2016 7:56 pm Post subject: Re: Better maybe !!!! I love seeing old documents like these. Imagination at work. Posted: Fri Oct 14, 2016 9:22 pm Post subject: Re: Better maybe !!!! Posted: Fri Oct 14, 2016 9:44 pm Post subject: Re: Better maybe !!!! It looks like the trigger mechanism is just like one on a pistol. Just under the trigger guard is a flat spring (H) which is a disconnect spring for the sear (D) and when the mouse/rat steps on I (just under the rat) it lifts the lever at (B) which releases the sear, it springs (D) upward (because of the flat spring H) and forces the rod (G) to push against the trigger of the pistol. I love it, I'd like to make that mechanism just for the fun of it. Funny they actually got a patent for something so similar to a pistol mechanism, but maybe it's the idea of attaching it to a firearm. Wouldn't want it behind the refrigerator! Posted: Sat Oct 15, 2016 1:08 am Post subject: Re: Better maybe !!!! 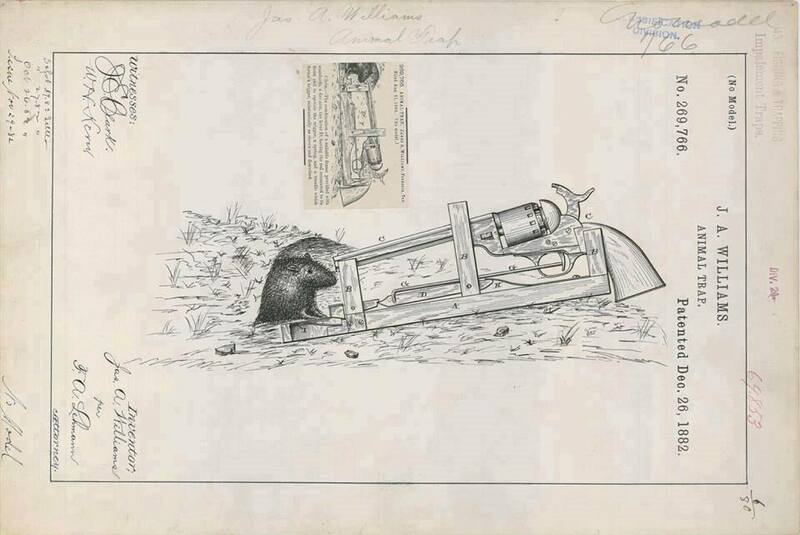 And I can imagine that it's being used many years ago as I've seen other mouse-traps working with blackpowder. For such applications they didn't put the lead ball on top of the BP, the flame and the particles of BP are enough to do the job (same as shooting balloons from a short disctance without using a back-stop). you see the picture? Should I patend this idea? Posted: Sat Oct 15, 2016 2:48 am Post subject: Re: Better maybe !!!! great idea and .22lr birdshot would work even better....dont let Radar see this as the drug/thugs over here have been known to boobie trap houses in similar fashion but they normally use sawn off .12ga.......plurry hard on the nerves of the boys n girls in blue. Posted: Sat Oct 15, 2016 10:39 am Post subject: Re: Better maybe !!!! Posted: Sat Oct 15, 2016 3:08 pm Post subject: Re: Better maybe !!!! #1 is a pressure foot which releases the lever hinged at B. That releases the catch between that lever and D.
D then pivots up because of the hinge and spring at H.
As D pivots up the rod G is moved toward the rear of the gun, discharging it. The mechanism is extremely complex for what it does when a simple spring release would do the same job.